The announcement earlier this week that more troops have been ordered to the U.S.-Mexico border prompted me to comb through relevant coverage from the last few months and edit together a timeline to help me grasp the facts. Thousands of Central American migrants, including men, women and entire families, are walking through southern Mexico, in the hope of reaching the US. Most of the people who make it to the border are likely to turn themselves in to US authorities and claim asylum, although a few – mostly younger men – have said they will attempt to cross illegally if that is not possible. Trump has said he will not let caravan members in, but the US is legally obliged to consider the cases of asylum seekers. The Pentagon announced Monday [10/28/18] that it will send up to 5,200 troops to the border ahead of the anticipated arrival of a caravan of Central American migrants that President Donald Trump has warned would not be able to enter the country. These troops, which "are in fact deploying with weapons" will join up to 2,000 National Guards already at the border for a combined force of about 7,200—or about the same amount of U.S. soldiers involved in the battle against the Islamic State militant group (ISIS) in Iraq and Syria. 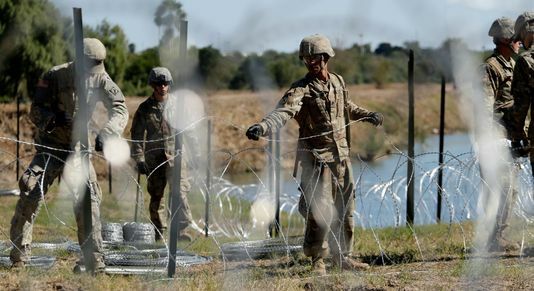 President Donald Trump on Thursday told troops deploying to the border they could shoot migrants who might throw rocks at them. All active duty forces dispatched to the border are governed by the 1878 Posse Comitatus Act, which forbids troops from carrying out law enforcement duties inside United States territory unless Congress grants an exemption. Under the act, federal military forces are prohibited from engaging in direct law enforcement, which includes making arrests, conducting searches, seizures, apprehension, evidence collection, interrogations, security patrols, seizures, stop and frisks, surveillance, crowd and traffic control, enforcement of a quarantine or isolation, or other similar police functions. Congress has amended that act some to increase the authorized level of support the military may provide for drug interdiction and to support border patrol. Defense Secretary James Mattis on Wednesday defended the deployment of thousands of US troops to the border with Mexico, saying the mission was “absolutely legal” and provides good training for war. Mattis, who visited the troops near the Texas town of Donna along with Homeland Security Secretary Kirstjen Nielsen, likened their mission to that of soldiers sent to counter the Mexican revolutionary Gen. Francisco “Pancho” Villa in 1916. “It’s very clear that support to border police or border patrol is necessary right now,” the Pentagon chief said, noting that that was the assessment of the Department of Homeland Security. While Mattis visited the troops at the southern tip of Texas near the Gulf of Mexico, migrants in a caravan of Central Americans scrambled to reach the US border some 1,500 miles away in Tijuana. 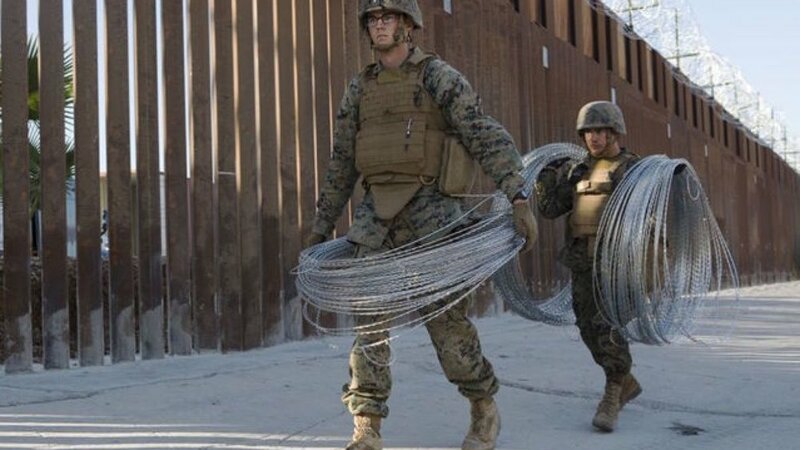 As hundreds of exhausted people in a caravan of Central American asylum seekers reached the U.S. border in Mexico on Friday [11/16/18], American troops worked to fortify the fence and port of entry separating the two countries with strands of razor wire.